Habit: Root generally > 15 cm, distally branched. Stem: 15--50(125) cm, base narrower than root, not firmly attached, generally glabrous. Leaf: generally on proximal 1/3 of stem, +- glabrous; lobes 3--10, generally > 6 mm wide. Inflorescence: pedicels 15--80 mm, 7--50 mm apart, glabrous to glandular-puberulent. Flower: sepals forward-pointing, scarlet to orange-red (dull yellow), lateral 8--16 mm, spur 12--34 mm; lower petals flattened, blades 2--3 mm, +- glabrous. Fruit: 13--26 mm, curved. Seed: smooth, collar inflated. Chromosomes: 2n=16. Ecology: Moist talus, wooded, rocky slopes; Elevation: < 2600 m. Bioregional Distribution: NW, CaR, n&c SN, ScV, CW (exc SCoRI), nw MP; Distribution Outside California: to southwestern Oregon. Flowering Time: Mar--Jun Note: Generally hummingbird-pollinated. Synonyms: Delphinium armeniacum A. Heller, illeg. Unabridged Note: May hybridize with Delphinium andersonii, Delphinium antoninum, Delphinium decorum, Delphinium depauperatum, Delphinium luteum, Delphinium nuttallianum, Delphinium patens, Delphinium trolliifolium. Petals maroon to magenta in putative hybrids. 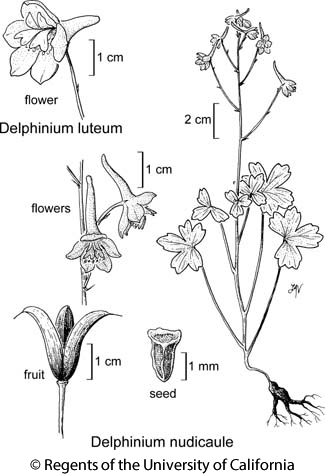 Citation for this treatment: Jason A. Koontz & Michael J. Warnock 2012, Delphinium nudicaule, in Jepson Flora Project (eds.) Jepson eFlora, http://ucjeps.berkeley.edu/eflora/eflora_display.php?tid=22492, accessed on April 23, 2019. NW, CaR, n&c SN, ScV, CW (exc SCoRI), nw MP; Markers link to CCH specimen records. Yellow markers indicate records that may provide evidence for eFlora range revision or may have georeferencing or identification issues. Purple markers indicate specimens collected from a garden, greenhouse, or other non-wild location.